I’ve been working with wood since the age of eleven. In 1984 my family moved to Cincinnati from Greenwich, CT. Being a shy kid, I didn’t make many friends so most of my free time I spent tinkering around my dad’s shop. My dad wasn’t a woodworker but he did have some modest tools like a bench top drill press and a band saw, so I started making small little toys. I continued working with wood taking shop class throughout my junior high and high school years. After school and during the summer I built several Toys and Joys cars and trucks. Below is a sample of things I made between the ages of twelve and sixteen. Around the age of thirteen, I started collecting antique tools. When visiting my grandparents in Detroit, MI, I would always hang out in my grandpa’s garage. He was a mechanic who restored old cars like Model T’s and had a 1919 Maxwell in his garage that I thought was the coolest thing on earth. My grandfather seeing that I had an interest in woodworking, gave me a few his tools he never used. 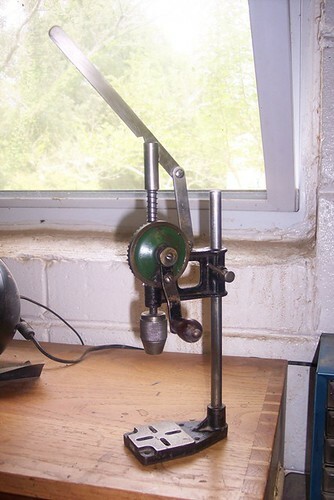 The first tool he gave me was an old hand cranked drill press that I still own today. While staying with my grandparents for a few weeks during the summer, they would take me to area flea markets to find some bargains for themselves. Extremely bored, I decided to look around for some old tools to add to my budding collection of hand tools. After a few purchases of hand planes, I became an antique tool collector. When I attended a couple of The Ohio Tool Collectors Association meetings in 1989, I noticed I was the youngest antique tool collector in the room. Over twenty five years later, I probably still am. 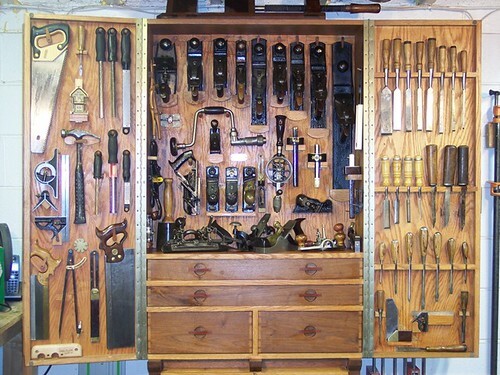 This is my tool cabinet full of antique tools that I use on a daily basis. I update it about once a year and replace some of the old tools with new tools I recently purchased. As it stands it holds about 200 tools, most of them being antique. After graduating from high school, I attended the University of Cincinnati. I originally wanted to take Industrial Arts Education and become a shop teacher. I was told by my high school guidance counselor that UC had that degree available. When I went to the new student orientation at UC, an administrator asked me what my major was. I told him Industrial Arts Education. He turned and looked at me with a strange look and said “UC hasn’t had that degree in thirty years”. Stunned I said “Okay I’ll take Business Administration.” I took Marketing in high school and really liked it. Five years later, I graduated with a Bachelor’s degree in Marketing. While I would love to work full-time on building furniture and have a business like Thomas Moser or Brian Boggs, I’m glad I have a day job with health benefits. In 2012 after temporarily losing my vision in my left eye and losing feelings in my legs, I was diagnosed with Devic’s Disease. I’ve healed a lot over the past few years, but I still have some lingering effects. I’m hopeful for the future as I’m currently on the right medication, but I may have some uphill battles to fight. If you enjoy my blog, please “Follow” me and tell your friends. I could always use a few more followers. Super nice tool cabinet. Any chance you would send me some close up shots of how the bench planes are held in place? I hung mine from strings knowing that one day I would “upgrade” to something like you have there. I’m glad you found my blog. The planes sit in wooden holders on the top and bottom I customized for each size of plane. They lay still in the cabinet with a simple wooden lever with a screw drilled through it. I simply turn the lever to the side to release the plane. Some smaller planes, like the block planes, are held to the cabinet with rare earth magnets. I need to update the cabinet with new tools so look for a blog about it in the coming weeks. 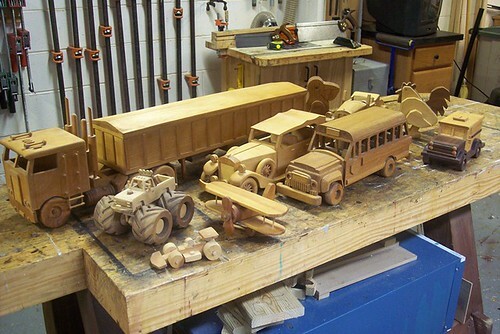 Cars and trucks ….nice work for that age…..And an interesting point…I was a IA Major ,thats how I got my start in furniture making,about 55 years ago and I am still at it. To this day I still regret not being a shop teacher, but I’d doubt I’d be employed with all schools shutting down classes. You already are a shop teacher, your blog is your school and your visitors are your students. Regret what you haven’t achieved, but from what I have seen on your blog, there’s nothing to regret. Thanks Salko, I wish I would have been proactive with my photos on Photobucket so my posts wouldn’t have been ruined. I got a lot of work to do.